The first is the "overlap" problem. The screenshot below is the famous MathJax tutorial post. This is not the only case where the overlap occurs (it's just I happened to browse this page and just caught it), in fact there are really many cases. The second is the "overflow" problem, which is much more common to be seen. The screenshot is an answer by @Oliver Oloa. Since it is impossible to scroll horizontally within iOS app, it's my impression that whenever a line is too long for the mobile phone screen, the overflowing part will be missing. I have to confess that these two display problems do cause some inconvenience sometimes, especially the "overflow" problem. Could anybody help? (Is it ok to ask here?). I know it's perhaps all because iPhone screen is too small to display a very long line which, however, would look just ok on PC. But I guess there would always be ways to solve such problems. Maybe forcibly break a long line into smaller lines so that the iPhone screen can hold? For the second problem, now I think maybe it's not necessary nor proper to forcibly break the lines, perhaps all that is needed to do is enable scrolling horizontally within iOS app. [I believe this needs to be transferred to meta.stackexchange.com]. the overlapping equation labeling. 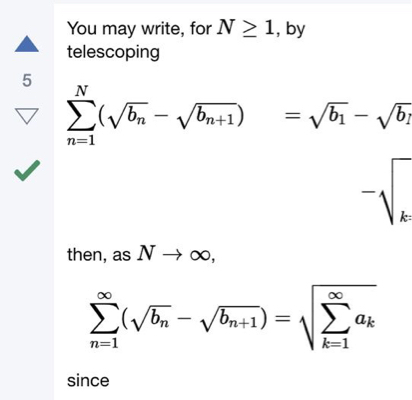 This is a bug in MathJax which we thought we had fixed in v2.5 -- sorry about that. the line-breaking/overflow issues. Linebreaking is a difficult problem and largely relies on the quality of the underlying markup (e.g., matching fences such as \right( ... \left) etc). However, tables (e.g., arrays which I suspect that screenshot shows) are generally not broken (for the obvious reason that they are tables) but line-breaking within table cells is also limited right now. The overflow is generally a feature (not a bug) in so far as MathJax's line-breaking algorithm considers a small overlap favorable over large amounts of white space at the end of a line. I don't have an iOS device available just now but on Android, overflowing equations are scrollable so you can still access the overflowing part. That might actually a bug (or limitation) of the iOS app. Perhaps you could confirm that? Per my answer on Meta.SE I'm adding scrolling to wide display MathJax and upgrading to 2.5.3. This has not solved the problem of tags overlapping with equations, but as Peter mentioned it's a known issue in MathJax. The changes will appear in the next build. Not the answer you're looking for? 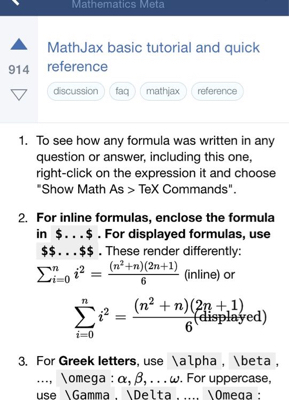 Browse other questions tagged support bug status-completed mathjax ios-app . What are some options for putting another, smaller copy of this long Latex item?